A majority of registered voters in America (58 percent) think that President Trump is intelligent, according to a new Quinnipiac University poll.1 Sixty-two percent say he is a “strong person.” A whopping 72 percent support his decision to meet with North Korean leader Kim Jong Un. (A summit is scheduled for next week.) About half of American voters (49 percent) approve of Trump’s stewardship of the economy, and the same share says Trump is more responsible than former President Obama for the current state of the economy. On the other hand, a majority of voters don’t think Trump cares about average Americans (55 percent), has good leadership skills (56 percent) or shares their values (61 percent). They don’t believe he is honest (59 percent), level-headed (64 percent) or a good role model for children (69 percent). They disapprove of his handling of foreign policy (52 percent) and immigration issues (58 percent). Overall, 40 percent of Americans approve of Trump’s job performance in this survey, compared with 51 percent who disapprove — fairly similar to other polls of the president’s standing. 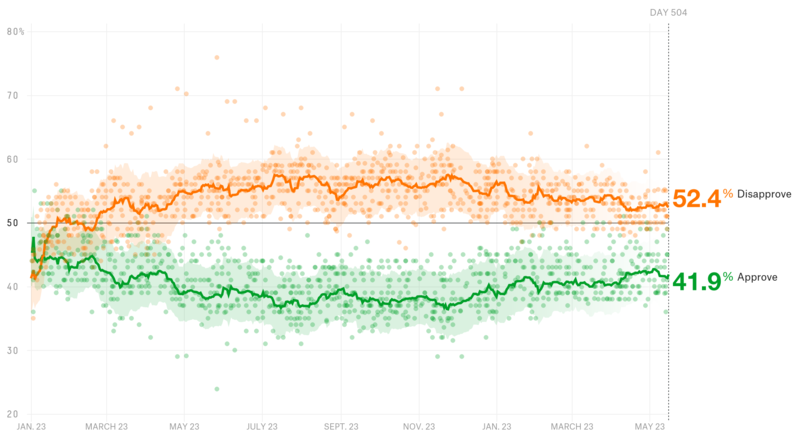 I think this data suggests that Trump won’t become significantly more popular simply by emphasizing “peace” (his North Korea diplomacy) and “prosperity” (the economy) — a message that Republicans have started to push. Trump’s popularity — and thus the GOP’s midterm fortunes — is likely being dragged down by his personality characteristics and behavior. He should probably, say, stop tweeting. He would likely help his position if he stopped telling so many lies. Trump’s more unusual policy moves also seem to be costing him support. His conservative stances on immigration may be how he won the Republican primary in 2016, but I doubt that policies like separating children from their parents at the border are helping with how Americans view his immigration agenda. And feuding with Canadian, Mexican and European leaders over tariffs is unlikely to help his standing on foreign policy. 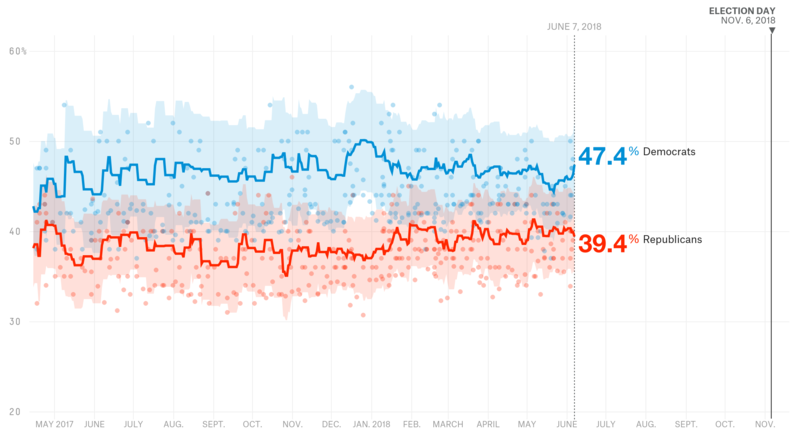 It’s worth considering: If Trump is at 40 percent approval right now, despite the strong economy, would a more typical Republican president be in the upper 40s or even at 50 percent? Jeb Bush and Marco Rubio lost badly to Trump in the primary. Perhaps they were too traditionally Republican to win states like Pennsylvania and Wisconsin that Trump flipped to the GOP side in the 2016 general election. But if Bush or Rubio had been elected president, I assume that either of them would have had tax-cutting and deregulation economic policies similar to Trump’s. (Though it’s not clear that Trump’s policies are the reason for the strong economy of the last year anyway.) They likely would have steered clear of hardline immigration policies and avoided feuds with Canada’s prime minister and the Philadelphia Eagles. I’m almost certain that neither of them would be constantly making false statements. The Republicans might keep control of both houses of Congress in 2018. They might win the White House again in 2020. But at a time when The New York Times is describing current economic conditions in the U.S. as “great,” “excellent” and “splendid,” Trump may be squandering a potential strength for the Republican Party because he is not, well, level-headed. The situations are not analogous, but I’m sure Democrats would have preferred one of the greatest economic booms in modern times not to have coincided with the fallout of Bill Clinton’s affair with a White House intern. 70 percent of Americans support direct talks between the U.S. and North Korea to end the North’s nuclear program, but only 29 percent believe it’s “very” or “somewhat” likely that North Korea will agree to dismantle its nuclear weapons, according to a new YouGov poll. The Trump administration recently announced that it will impose tariffs on steel and aluminum imported from the European Union, Canada and Mexico. A Morning Consult poll found that 40 percent of registered voters oppose those tariffs and 38 percent support them. Sixty-two percent of Republicans but only 22 percent of Democrats support them. A MassInc Polling Group survey found that 77 percent of registered voters in Massachusetts support increasing the state’s tax on incomes over $1 million. 72 percent of voters think Trump tweets too much, according to a Morning Consult poll. That’s up from 56 percent just before the start of his term. Pew polled teenagers between the ages of 13 and 17 about their technology and social media habits and found that those from lower-income households are more likely to use Facebook than their peers from higher-income households: 70 percent of teens from households with incomes of less that $30,000 said they use Facebook, but only 36 percent of teens from households with incomes of $75,000 or more said they did. 56 percent of Americans said tech companies should take steps to restrict false information online even if it limits freedom of information, according to a Pew Research Center survey. Thirty-nine percent believe the U.S. government should take such steps. Democrats and Republicans are almost equally resistant to government action, but Democrats are more likely than Republicans to support such actions by tech companies. Marist conducted a poll about online shopping and found that only 10 percent of Americans have used a fresh grocery delivery service and only about 2 percent are subscribed to meal kit subscription services like Blue Apron or HelloFresh. A YouGov survey in England found that 72 percent of people 65 and older said they were proud to be English but only 45 percent of people between ages 18 and 24 said the same. About 47.4 percent of Americans would back a Democratic House candidate, compared with 39.4 percent who would support a Republican one. That Democratic edge is expanded from this time last month, when they led 46.9 percent to 41.3 percent. Including more than a quarter of Democrats.